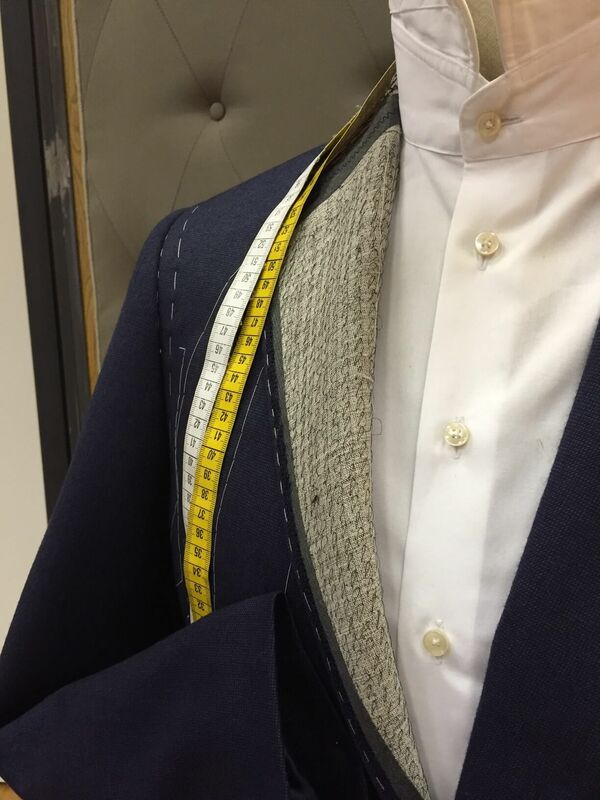 In the past (we are talking 40 and more years ago), tailors needed to give any woolen jacket an interior that helps the material to hold its shape against the body. That is why they blind stitched a horsehair- canvas (looks a bit like linen) to the main fabric. After the material has been soaked in water and dryed , it is then attached with blind stitches and padded, where needed. The canvas therefore helps the chest area to form well, while the rest of the jacket drapes very naturally. If a suit is made the traditional way it will take up to 60 hours of work and sets you back more than 4,000 GBP in London’s famous Savile Row. At Alexander we offer a full canvas jacket with handmade button holes for an extra charge of 2,200 ZAR incl VAT. 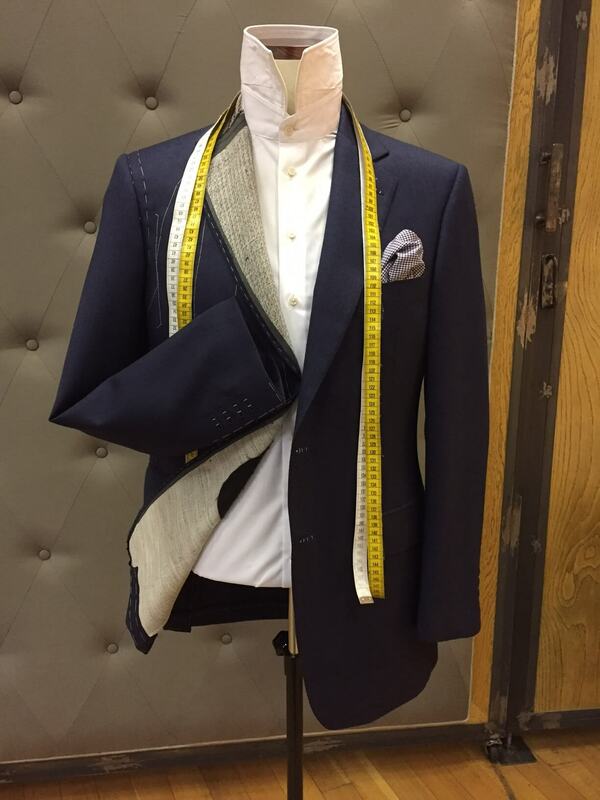 With today’s technology and knowledge, suits can be produced in large quantities without the physical labour and material cost of a canvassed jacket, the process is called “fused finish”. Most of the suits you will find in the stores are practically glued. How is this achieved? Special fabrics, called interlinings, are cut to the same size as the jacket panels. Both “layers” are then run through a heat press. During that process, the interlining produces a glue that holds both items firmly together and gives the jacket panel an immediate shape. In a next step, a chest piece is added to the jacket. This chest piece consists of several layers of canvas and padding. Not as evenly spread as in the handmade version, but still small and effective, giving the jacket a good shape. The materials and interlinings used nowadays are of very good quality and one doesn’t have to expect any setbacks just because a jacket is fused. In fact, you will be amazed how beautiful and light a jacket can be made with fused finishes. And since engineering also enabled us to sit in Airbus planes that are glued together, we should definitely appreciate that technology on our garments. At Alexander Suits the standard production finish is semi- canvassed, which combines the best of the two worlds. First of all, the canvas is blind stitched around the complete chest and lapel. This process is production based and done with a high precision machine. The canvas is attached where it is needed most. The rest of the jacket panel is equipped with state of the art interlinings, so the drape towards the bottom is beautiful and light. For the connoisseurs we offer the full canvas finish at a surcharge of 2,200 ZAR. In addition to the semi- finish, the canvas is sewn to the bottom half by hand and the buttonholes are made by hand, as well.